So, in a shameless and lazy act i am going to plug my rotary club’s annual golf tournament happening this Saturday by adding this post which is the Presidents message I have written for the tournament booklet. I have really been far to busy the past couple of weeks with Christmas and New Years and all the travel and family and friends visits to sit down and write a post. On top of that there seems to be a big boost in interest in real estate lately with a ton of new inquiries, some deals going forward and an endless stream of appraisal work. Here’s to hoping the trend continues throughout the year! And here is the message i threw together last night. First of all, my heartfelt thank you and appreciation to all of the people who support this wonderful annual event, both the golf and the evening festivities. Withou your support and desire to have some fun, there would be no golf tournament. 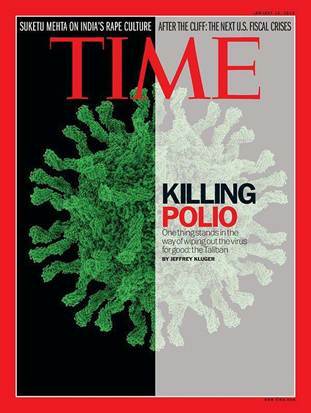 It is quite appropo that this month, Tim Magazine’s front page is a piece about the fight to end polio and Rotary International is named front stage. To quote from it “Thanks to aggressive global vaccination programs led by Rotary International, UNICEF, the World Health Organization, the U.S. Centers for Disease Control, and, most recently, the Bill and Melinda Gates Foundation, the year just beginning could be the disease’s last.” As you may or may not know Rotary International banner cause is the eradication of Polio and 2012 was the year that India was declared Polio free and there are expected to less than 100 cases worldwide this coming year. It is an astounding feat of humanity that shows what we are capable of. Whether or not you personally provided any support, I believe this is an accomplishment that all of us should be proud of. Indeed we are living in “Interesting Times”. That said, ‘Our Little Club’ does support the polio eradication effort monetarily every year and this year we once again met our goal of $3,000 toward this cause. Rotary truly is a wonderful organization and I am proud to be struggling to equal the accomplishments and contributions that the prior presidents of the club have made. I can only hope to be able to fulfill a fraction of the works that some of our illustrious previous presidents. We are a small club this year struggling with the times and trying to cope with the changes both internally and externally but the club will persist and will still be supporting the community of Abaco for many years in to the future. It already has a 40+ year history and I expect it will have 40+ more ahead of it. The following page has a brief synopsis of some of the prior projects of the Rotary Club, many of which occurr annually. In closing, I wish to make a note that the funds raised from the golf tournament are typically applied to our key areas of focus for our club which involve youth programs, and perhaps another blood drive this coming year. This year we have endeavoured to foster the start of a Rotaract Club of Abaco, an arm of Rotary suited for young professional between 18 and 30 years of age. Membership in this club will help these young folks gain leadership skills, serve their community as a group and will hopefully lead to increased membership for our quaint Rotary Club. 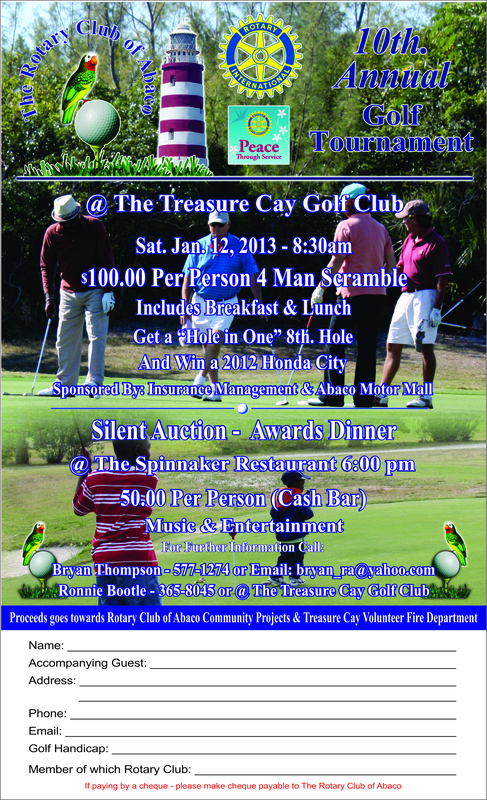 In keeping with my motto for the year 2012-2013, Rotary Returns, may this golf tournament return to you much enjoyment and perhaps a better game. Happy Golfing!